St. Don Bosco – A Patron of Youth | The Size of a Mustard Seed. Matthew 17:20. If there is one thing that everyone knows about teenagers, it is that we are not easy to keep under control. I am a teenage girl, and very well aware of this fact. By nature, we are impulsive, hyper, and loud. Thus, logic would tell us that this age group is always in need of guidance and most of all love. Although, it is also very true that young people, with the blessing of this proper guidance and love, can be some of the most passionate and inspiring generations to witness. I have had the blessing of seeing this in my own generation. On a daily basis, I am inspired by my friends and the youth around me. It is true that teenagers can be extremely difficult, but they can also do tremendous amounts of good work. And St. Don Bosco was incredibly aware of this. John Bosco (Don is a title for priests in Italian) was born to a very simple Italian family of farmers. From a very young age he knew that God was calling him to be a priest, and by God’s grace he was ordained in Turin in the year 1841. 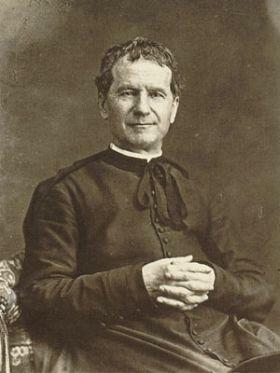 As a priest, Don Bosco immediately took to the young boys of the city. Many of these boys worked in factories or took whatever job they could find. These young men were subject to the terrible conditions of their workplace, very low wages, and extremely long hours. Most of them were very poor, and had no education or family life. Bosco made it his mission to care for these young men. He visited the sweatshops and jails and witnessed the desperate need these boys were in for love, education, and some healthy fun. This determined priest began to form a bond with some boys and would tell them to come back to the church every Sunday. He would promise them food (which they were in much need of), games, and religious education. Soon, there were more and more boys coming to Don Bosco’s talks and he gave the group the title “The Oratory”. Their weekly meetings began with confessions, then a mass said by Fr. Bosco, followed by beautiful religious instruction. Then this rag-tag group of 200 boys and the lively priest would head to the country for a full session of sports and games. The day would conclude with an inspiring talk and the boys would joyfully head home. By the grace of God more and more youth were flooding to the care of this saintly priest. Many of these new boys were orphans, in need of even more care and teaching. By this point, Don Bosco had by the grace of God had bought a lot and built “The oratory of St. Francis the Sales”. This was some land with a shed that he made into a chapel. 500 boys were now attending his oratory days. But he soon realized that the orphans were in need of somewhere to stay. He built a house next to the shed for the boarding boys. Soon, there was also a trade school up and running so that the students could learn vital skills which they could use to find good work. St. Don Bosco’s dream of caring for boys had become a reality. By the grace of God, he was transforming the lives of hundreds of boys. He was joyfully fulfilling the mission that God had given him with these young men. Fr. Bosco looked past the fact that these boys maybe hard to work with at times. Instead, he saw their potential. He also saw that with some love and guidance they could become incredible young men. He focused on making them men of faith. He was helping them become what they were made to be, saints. Just like our beautiful saint from yesterday, there are so many incredible things worth mentioning, which again, God willing, we will come back to later. So let us pray for the grace to follow God’s mission for us. To be able to trust in God’s help in overcoming all obstacles. To, like this great saint, have a beautiful devotion and love to Mary. And to always see Christ in everyone we serve…to be a source of love for all. Saint Don Bosco, Pray for us!